View our French Pave rings here. 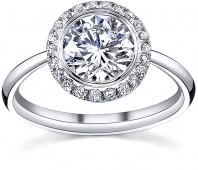 French Pave engagement rings are once again becoming very popular. The term French Pave describes a certain look for the way the diamonds are mounted in the ring and is very similar to a micro pave setting. 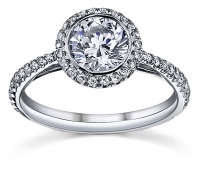 The pave style creates a wonderful look that make the ring sparkle. As you may have guessed the word pave, or more accurately pavé, comes from the French and means paved. When it comes to jewelry, French Pave refers to the illusion of the smaller diamonds being set close together and with such precision that the diamonds appear to be paved onto the setting. Pave set diamonds on a ring bring a brilliant display of diamonds to the ring making it look many times more valuable than you actually paid for the jewelry. This is the allure of french pave engagement rings. What Makes French Pave Rings Special? 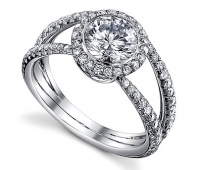 In order to make a french pave ring, much attention is given to the detail of the setting. A skilled craftsman will work on the ring right from the casting to ensure the final quality of the ring. At Novori Jewelry, our craftsmen have over 30 years of experience in creating french pave rings and mounting pave diamonds. We stand behind our workmanship and products 100%. With a pave ring, much more time and effort is given to the setting of the small diamonds to ensure the ring is finished cleanly and more importantly the smaller pave diamonds on the ring are securely mounted. Although one might think that the smaller diamonds might be at risk, the nature of a french pave diamond ring setting allows each diamond to secure the diamond next to it. 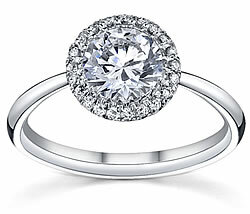 As long as the diamond ring does not get hit or damaged, the smaller pave diamonds will be secure. As with any jewelry it is a good idea to have the ring setting inspected regularly to ensure all the diamonds are secure and that the ring has indeed not been damaged. Careful with that French Pave Ring! A french pave ring looks so delicate and fragile do you really need to be more careful with this style of ring than any other? Well yes and no. French pave rings contain many small diamonds individually set so you should be more careful when and where you wear the ring. You would not want to wear a french pave ring in harsh environments like when you are gardening or using tools. Other than that, french pave diamond rings wear just like any other diamond ring. If you have a french pave ring resized, ensure that the resizing is done by a reputable jeweler like Novori Jewelry because if the diamond resize is not done properly, the diamonds may become loose and may fall out. Resizing of a french pave ring can be difficult especially if it needs to be sized more than 1 finger size up or down. And as always avoid cheap imports or low quality bargain brands as some of these have diamonds that are glued in place rather than using a prong setting to save costs. Novori Jewelry manufactures all of it's jewelry right here in the USA for quality purposes. French pave rings are simply beautiful and can add much sparkle and glamour to an otherwise ordinary ring style. And when looking for a diamond for your ring always keep in mind the four Cs of diamond shopping -- cut, clarity, color, and carats -- and you'll be fine. If you do need assistance with finding the right french pave ring you can always give us a call toll free at 1-877-877-4141. We are always ready to help you.